When I’m brainstorming ideas for almost any renovation or project in or out of the house, I first head to Houzz and Pinterest to collect ideas that I then go back and do some sifting and winnowing to see which ideas really stick. I’m not the only one who uses these tools like that, which is why they can be pretty good indications of what’s popular at the moment. 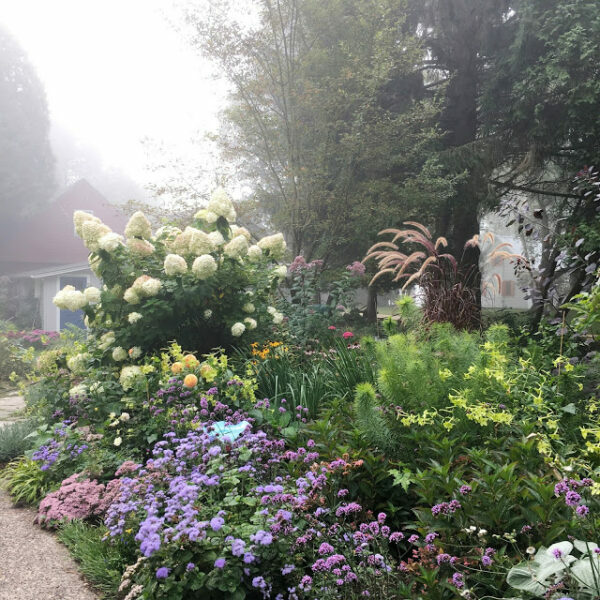 As I’ve said in the past, garden trends are more difficult to spot, because gardens don’t change as frequently or dramatically as interior spaces do, but you can at least get an idea of what the public is craving in terms of garden design. 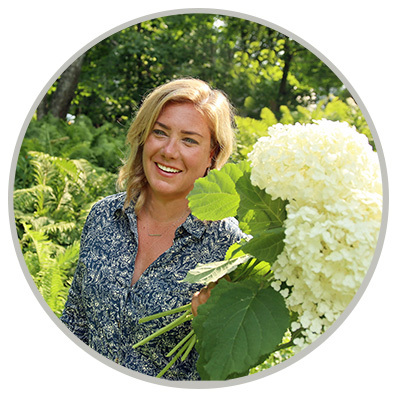 So I’m using some of the most popular photos on Houzz along with my crystal ball to go out on a limb and offer a few garden trends for 2018. 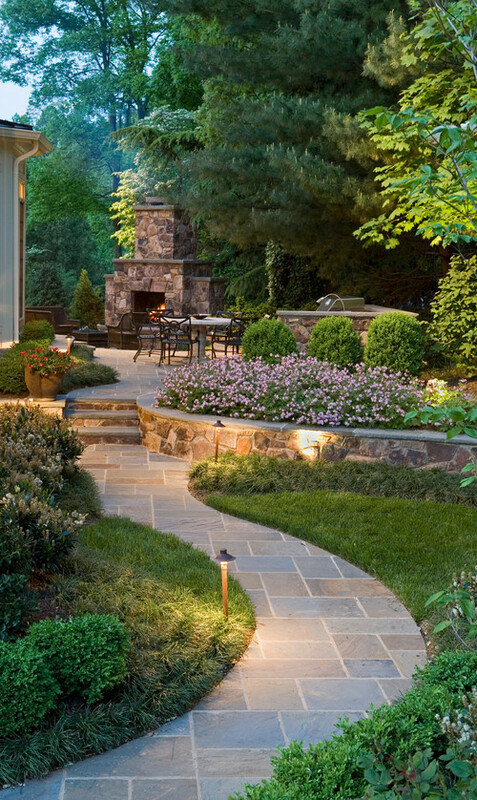 This next photo appears to be one of the most popular landscaping photos on all of Houzz. I can’t tell you how sad that makes me. This random stone fire pit with rocks that apparently fell conveniently from the sky is such a missed opportunity. Imagine what something like this would look like with some plants around it, and a meandering path that allowed for a bit of mystery and anticipation. But the popularity of this photo tells us one thing: People love fire pits. Actually, what I think people are really attracted to is a reason to gather in the yard, and a fire pit seems to be the most popular reason. Look for highly useable spaces to entertain and gather to be popular in 2018. 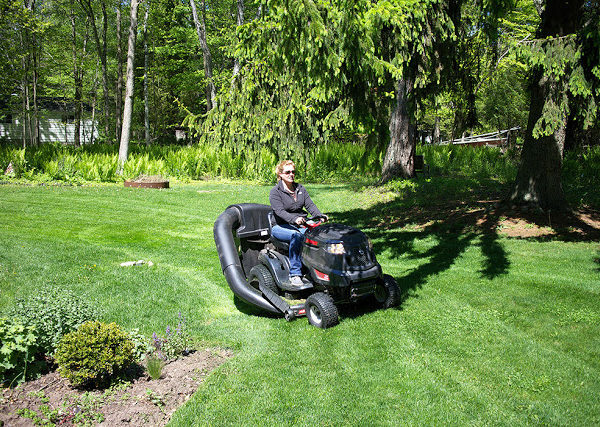 I just think that the average homeowner has to have a better reason than “pretty” to spend the money on a landscaping improvement. 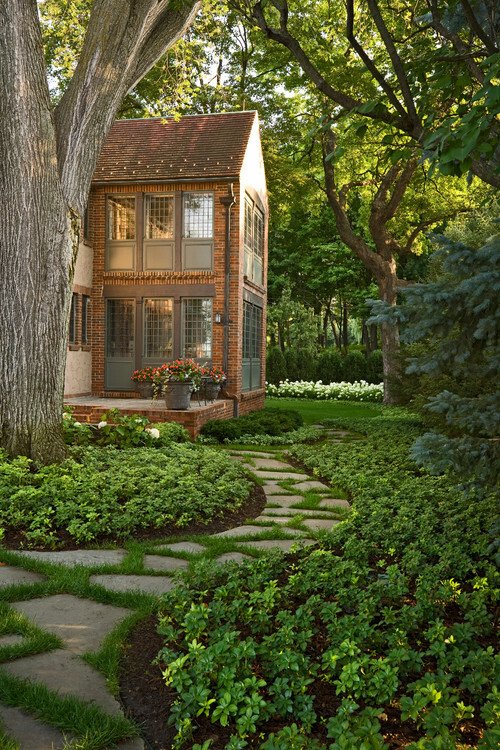 This next photo is the most popular landscaping photo of all time on Houzz and you can see why: a great path through a garden that leads to a perfect patio destination. Since I’ve been doing these trend prediction stories, there has always been an edible gardening component and there’s a good reason for that. I continue to believe that more people get into gardening today to grow edibles and then stick around for the pretty stuff. 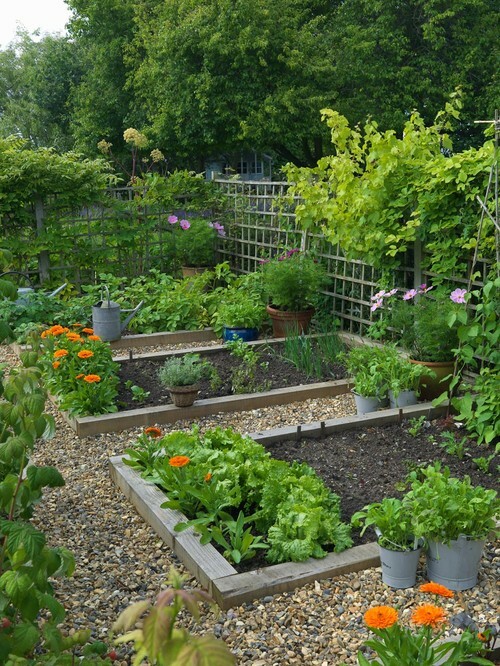 This simple raised-bed vegetable garden photo was popular in 2017 and I think it’s an indication that the trend will continue. Last year I predicted that color would be returning to gardens, just like color is returning to kitchens, slowly but surely. I hope the popularity of the next two photos is an indication that not only was I right, but that that will continue. Too many homeowners seem to equate a limited color palette to low maintenance and I think that’s rarely the case. Anyway, I think gardens will be more colorful in 2018 and beyond. I don’t have a lot to base this next “trend” on other than a hunch, but I think that more people are going to seek professional help to design landscapes in coming years. That’s not to say that they won’t install new outdoor spaces themselves, but I think homeowners are starting to realize the value of professional advice in the design stage. 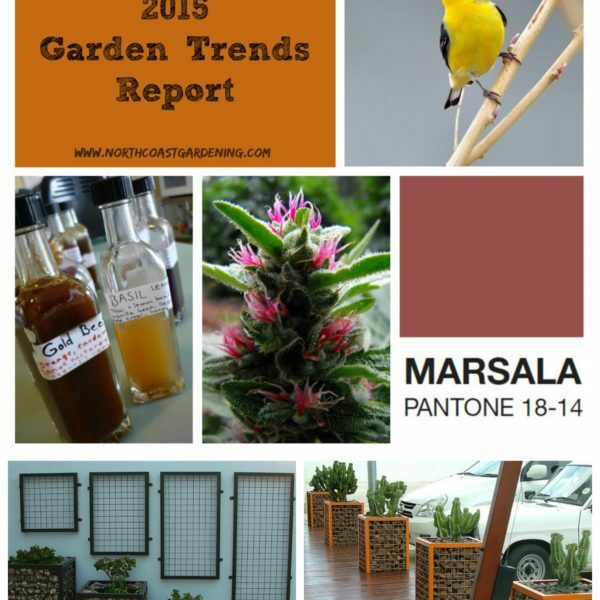 I can see that being particularly helpful when it comes the next trend I’ll talk about: lower maintenance gardens. 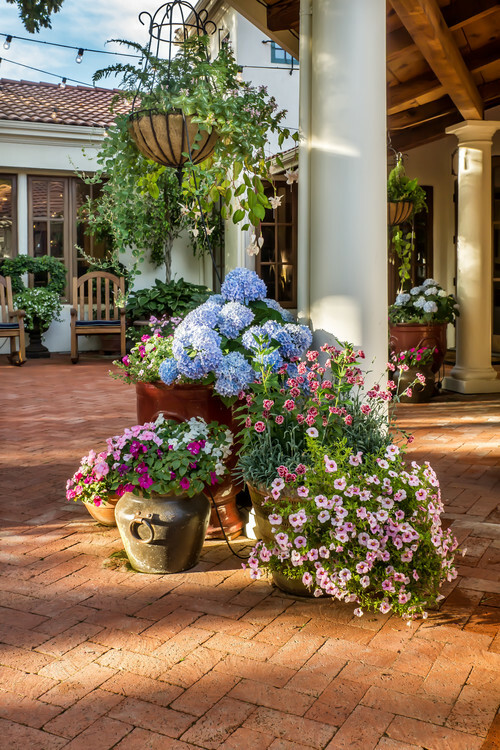 Plant selection and layout is absolutely key to have a good looking landscape that doesn’t demand a lot of time. I’ll be the first one to tell you that the idea of a no-maintenance landscape is a marketing strategy founded on an impossible idea. 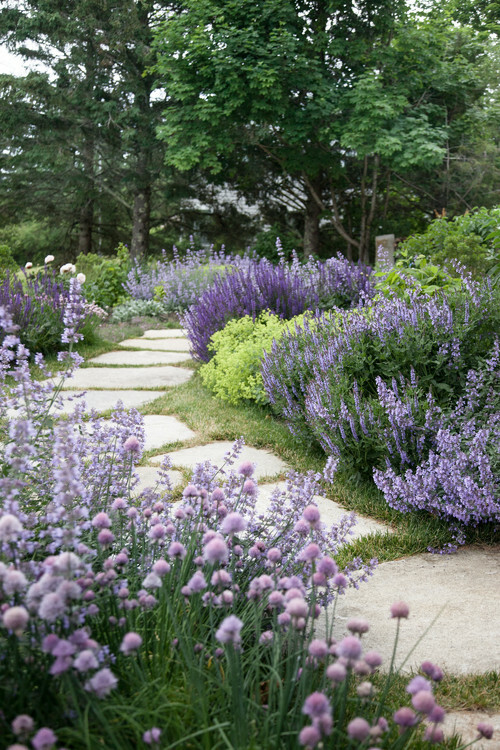 But lower-maintenance landscapes are possible and will continue to be popular. 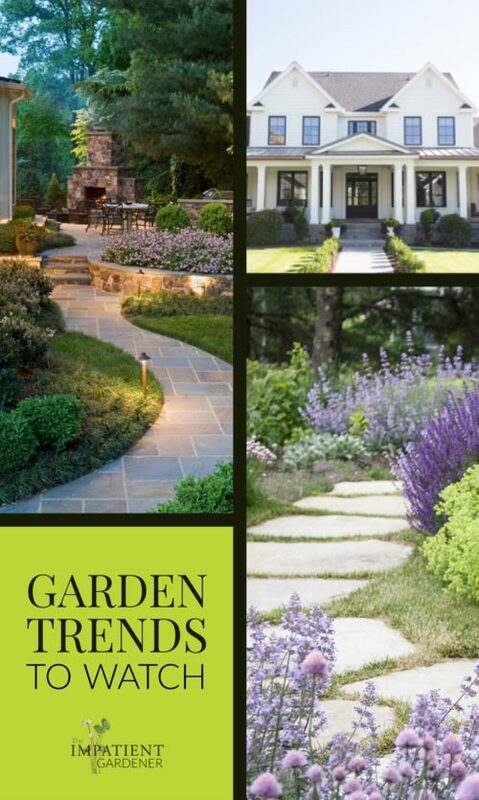 Landscaping will become more popular amongst design types. That’s a strange way to phrase it, but I think designers are no longer going to look at landscaping as money taken out of their budgets that could be spent on marble countertops, but an important part of designing a home. That love affair that design bloggers had with the fiddleleaf fig will transfer outside where I predict they will look to very clean boxwood-heavy landscapes. Of course high-end homes have always (well, usually) had proper landscaping, but I think that has trickled down to more average builds as well. Imagine the home below if there were no plants. I can guarantee you there would be no feature photos of the exterior. Containers will be king. Interesting new plants and the ease of availability means that more people will enter gardening through container gardening. 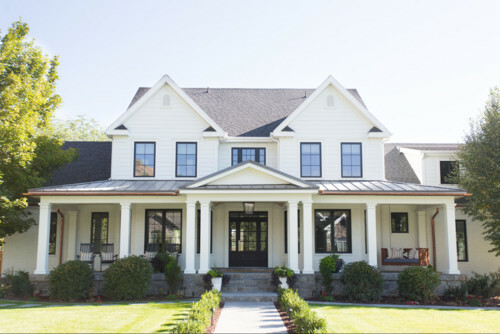 Not only is it something that anyone can do regardless of whether they own or rent, it’s also inexpensive, easy to do and the quickest way to add interest to an exterior. 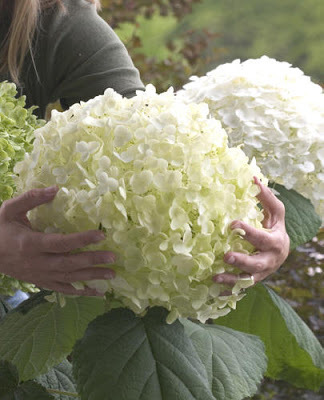 Even non-gardeners will be catching the container gardening bug. Curious as to how my past predictions have gone? Me too! I purposely avoided rereading them until after I wrote this so I wouldn’t be influenced by what I wrote in other years. Size up my predictions for 2017 and 2016 and see how you think I did. What do you think gardens will look like in 2018? Ahhh yes, the fire pit. Love em. The one in the second picture reminds me of my childhood. My Dad built a big bar b q pit in the back yard. A lot of fond memories around that pit. It looked more like the first picture as we just walked out to it at the far end of the garden. Not much was around it. Plenty of room for family and friends to set up their lawn chairs to watch dinner cook. I sure hope more color comes into the gardens. That is my goal for this summer. I want more color during that lull that seems to happen after the spring flush and before the autumn color. As we drove through the country side doing the Christmas Bird Count we came upon a huge newly built house. It had been there long enough to have grass growing all around it but not a shrub, tree or any other type of growing plant. Made me really curious. I will be driving by in a few months to see if they plant anything being the nosy person that I am. Hiring a designer is well worth the money. Most will charge just for the designing and turn you loose if you chose that way. It makes it quite affordable. I enjoy your predictions. Let the leaves fall as you know they will. I hope that house you saw does have something. I think I would go mad in even the world’s most amazing house if outside of it there was nothing but a patchy lawn. It’s good to have projects on tap! Good luck. My next project will be to use the historic bricks that are piled up on my driveway. I will make a sidewalk and a little sitting area. I like the herringbone pattern in one of your photos. Also, I have gone on a massive restocking and expansion of perennial beds so I feel I am almost done. Now to sit back and see what thrives and what doesn’t. I have one small area to put back together again as a dry stream with a few built-in bird bathes. And my bugbear: how to get everything well-staged in the various flowerbeds. It would be nice to have something in bloom spring, summer and fall. 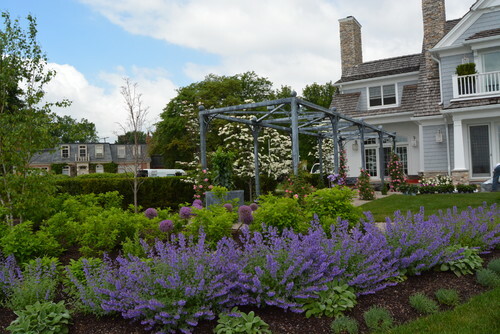 We have gradually converted most things to low maintenance and perennials. At the moment, I have beds that are seasonal (a spring bed, a summer bed,etc) but few beds that are three seasons. I love a herringbone path! Go for it. As for all-season garden, it’s something I still have to work for, but I’m getting better at it (although looking around in winter, it’s pretty bleak). Had to laugh at the fire pit. Definitely need some plants out there and they need to set those giant rocks a bit below grade so they look more natural. 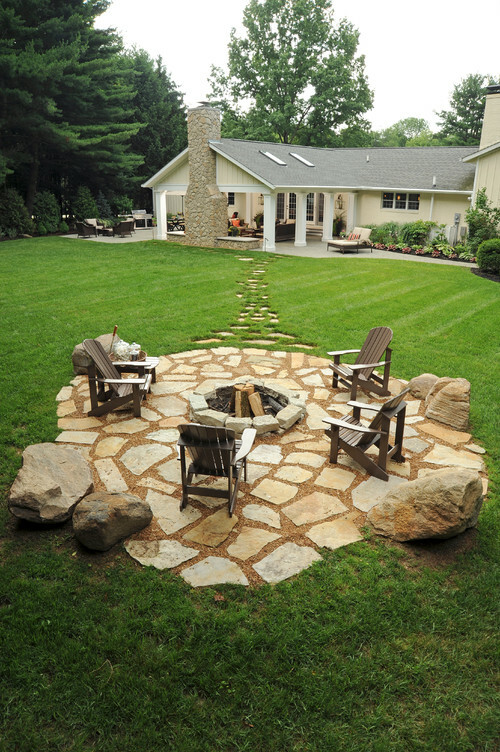 But I wonder why you need a fire pit when the house has that great stone fireplace and covered area? 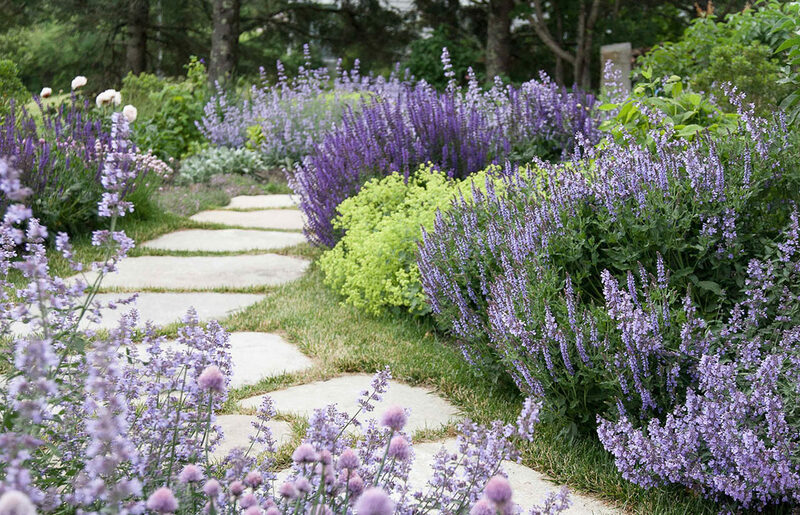 The lavenders in the color in the garden image is swoon-worthy. The area where I am adding color is lilies. Reds, oranges, yellows. Somehow I can take their intense color in my garden in a way that seems to work with everything else. I still do love to lose myself in Pinterest. Currently looking for ideas to turn the guest bedroom into my studio. My niece is coming for the bed as soon as it warms up a bit. Happy New Year to you two and your companions! I don’t mean to rain on anyone’s parade, but that fire pit is not my thing and the rock are certainly the most prominent feature. Good luck with the guest bedroom and happy new year to you! Edible gardening and indoor gardening/houseplants seem to be the biggest trends I see. Everyone and their dog is buying a succulent it seems. 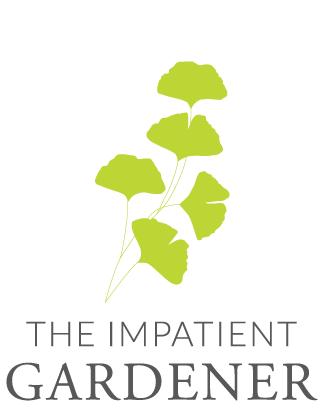 I would love to be able to find more general flower gardeners but it is hard to filter through all the edibles and pothos. we have a fire pit but it is mostly utilitarian—burn the extra crap around the yard. I’d love to put some of that into better use, like a woody compost pile but hub likes to burrrrrrn. We have some extra stones from around a flower bed we redesigned that were saved for this purpose but it has never been implemented. Maybe next year? ?